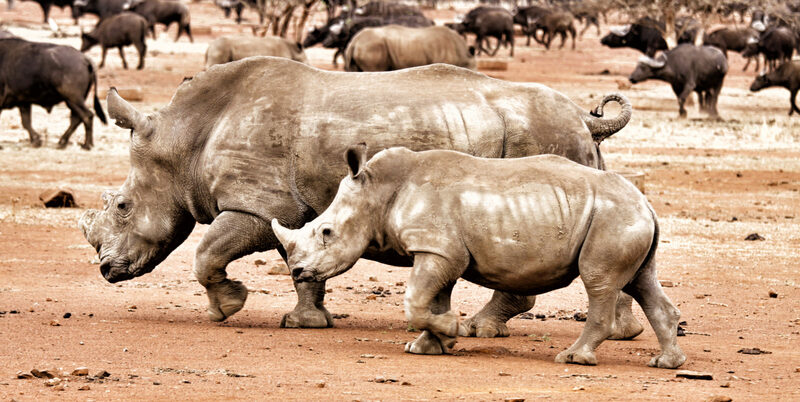 South Africa is playing a dangerous double game with rhinos and it’s time to ask why. The department doesn’t appear to have a clue how to save them from extinction. His irritation is understandable. The department appears to be playing a double game and is tying itself in knots trying to explain it. Part of the department’s presentation was what it plans to present to the Convention on International Trade in Endangered Species of Wild Fauna and Flora (CITES) in Sri Lanka in May 2019. In terms of the convention, rhinos fall under what’s known as Appendix 1 and may not be traded internationally for commercial gain. A few meetings back, South Africa and Swaziland convinced CITES they had a robust population and were granted an exception, allowing commercial trade of live rhinos under Appendix 11. What became clear in the parliamentary presentation is that the department now wants to push CITES further, allowing it to trade in rhino horn as well. This is linked to an extraordinary legal spat between the department and commercial rhino breeders in 2015 which ended with a judge lifting the ban on the domestic trade in rhino horn in South Africa on a technicality (he said the state had not followed due process regarding public consultation before imposing the moratorium). The department incurred about R15-million in legal costs appealing against this decision, but strangely has made no attempt to correct the technicality, which could surely have been done for a fraction of this amount. Rhino horn has value only on Asian markets, but it’s trade is illegal under CITES. So why anyone would want to buy rhino horn in South Africa is hard to imagine unless they wish to trade it illegally. In other words, legalising horn sale within the country undoubtedly feeds illicit markets. But wait! Could it be synchronicity or careful planning that this week saw China announce that it would legalise domestic trade in antique tiger bone and rhino horn — reversing a 25-year-old ban? This will allow bone and horn products to be traded and used from captive-bred animals. The department’s approach is what it calls “demand management”. It sounds smart but it’s nuts. There are more than a billion people in Asia. Not all of them buy rhino horn, of course, but even a small increase in the percentage wishing to do so would be disastrous. Selling legal horn will signal that it’s ethically okay to buy it, boosting sales. The stocks of the few rhino farmers and sale of state stockpiles would soon be overwhelmed and poaching of wild rhinos — already shockingly high — would rise. The only sensible approach would be to reduce demand in every way possible. Without detailing how it intends to do so, the department told Parliament it would instead attempt to manipulate Asian consumer behaviour to choose legal horn over poached horn. Plans for this mammoth PR task were not in evidence, but maybe the department knew China planned to legalise bone and horn sales (we also sell China lion bones). What’s clear is that the department is angling to increase the sale of rhino horn while cracking down on poaching — eliminate illegal trade but at the same time stimulate a parallel legal market. In simple terms, stop the bad guys and so the good guys can make a profit. This has never worked, which is why CITES has called for the elimination of domestic ivory markets. Where legal markets exist, it’s been proved impossible to eliminate illegal markets. And sitting on the fence confuses everyone. The department’s position seems to be that we will keep the demand going until we are ready to supply the product. This has all the hallmarks of a corporate war between poachers backed by foreign syndicates and rhino farmers backed by the department. With China dangling a carrot in Beijing. It’s about who gets the money. The department claims it’s stance is in the interest of conservation and sustainability, but has absolutely no evidence to prove this. Of course there’s a hidden back story and questions need to be asked. Was the court case which opened the sale of rhino horn a serious attempt by the department to prevent sales, or a cover story to allow it to permit sales without taking responsibility? Why is the department prepared to brook international criticism, particularly at CITES, for what is blatantly market-driven and not conservation — fanned, it seems, by a few wealthy rhino farmers? What is the current size of the government horn stockpile from confiscations and natural deaths? Right now it’s worthless unless international sales are permitted. Is this part of departmental strategy? If it is, it will go up against a CITES requirement that confiscated horns may not be sold. Who is benefiting from the military and technological escalation of the war on poachers? Are brown envelopes involved? It would be difficult to prove, but conservation organisations have raised the question because of the fervently market-driven stance the department is taking on all wildlife issues for the benefit of the few. It’s hard to imagine that, at COP18 in Sri Lanka, CITES will countenance the sale of rhino parts. At COP15, the clause on trade in elephants was amended to include the “closure of domestic ivory markets that contribute to poaching and illegal trade”. At COP17, Swaziland’s proposal for unlimited trade in white rhinos was roundly rejected. And resolutions favoured reduction of demand, not “demand management”. But parties at COP are known to trade favours (a pro whale hunt vote for a pro rhino trade vote?). And South Africa got around the COP17 resolution forbidding the export of wild lion bones by permitting export from captive lion breeders. Why, exactly, did the department permit an annual quota of 1,500 lion skeletons? As a result there are now lion abattoirs, with some breeders happy to grossly underfeed their lions because only their bones are needed. According to the parliamentary submission, at COP18 South Africa will also attempt to block the uplisting of elephants and leopards to Appendix 1 (the highest conservation level), will apply to increase the numbers of endangered black rhino permitted for trophy hunting and try to open the door to the international trade in rhino horn. Frankly, it’s embarrassing. These positions align with the purely commercial goals of mainly independent operators and have little to do with the department’s core function of conservation. As justification, the department cites sustainable utilisation, a term increasingly used by trophy hunters and sanctions the often extremely cruel practises by game farmers “conserving” lions. He said the time had come to rethink the whole notion of sustainability.